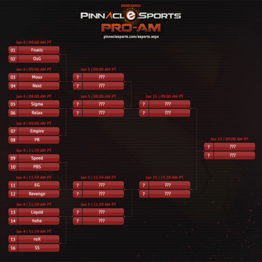 The Dota 2 tournament “PRO-AM” is the first eSports tournament hosted by an online bookmaker, that is: Pinnacle Sports. 16 of the world’s Top Dota 2 teams will battle it out in the PRO AM for a total prizepool of $ 10,000. The tournament starts on January 4th 2014 and the finals are on January 12th. Every match of this tournament will be streamed live and of course Pinnacle Sports is offering odds for all of the games during this Dota 2 Highlight! Moreover you can win a spot to play against the pros by betting on one of the matches at the PRO-AM tournament– read more about the Play with the Pros promotion here. All of the matches of the Dota 2 PRO-AM tournament will be streamed live on the official Website and on Twitch. You can watch the games here on our website as well.